CTE, Chronic Traumatic Encephalopathy, is a brain disease that is degenerative and progressive. It occurs as a result of repetitive head impacts. CTE has been found in people with or without a history of concussions. Concussions may add to the likelihood of getting CTE, but the biggest factor seems to be the length of time exposed to sub concussive hits. CTE was originally only thought to exist with boxers but it was later discovered in victims of physical abuse, head banging and poorly controlled epilepsy. Now it is being associated with athletes playing contact sports including American football, ice hockey, soccer, wrestling, extreme sports, as well as veterans and military personnel with a history of being exposed to repetitive hits from training or blasting. One of the largest concerns is the growing discovery of CTE in high school and college athletes and tragically athletes who only played sports at the youth level. The brain of a person with CTE gradually deteriorates and tau proteins begin to become defective and interfere with neuron functioning. At the current time CTE can only be verified through a specific autopsy. But there is a growing consensus among researchers that see the possibility of a clinical diagnosis of CTE, or TES (Traumatic Encephalopathy Syndrome). The clinical presentation of CTE usually begins with a lack of behavioral control: explosivity, impulsivity, rage behaviors, paranoia, violence, and loss of control. In most cases mood behaviors such as depression and anxiety occur. Memory issues, executive functioning deficits, and attention problems have also been noted. Addictive behaviors and suicidal thinking are also associated with CTE. Since often times the onset of CTE symptoms occurs many years after the RHIs, it is imperative for doctors, family members, morticians, policing entities, and rehab facilities to look for the possibility of CTE through examination of the history of each individual. 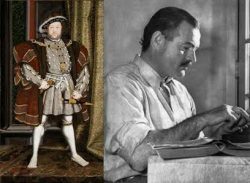 What do King Henry and Ernest Hemingway have in common? A history of repetitive head trauma and possibly CTE. King Henry was also known for his jousting prowess. Most kings avoided the dangerous sport but King Henry thought it an essential part of his leadership image and jousted for over 25 years. Researchers have made the case that brain disease as a result of his jousting passions eventually led to his sadness, unpredictable rages, madness, and memory difficulties. Ernest Hemingway played football in HS and had a passion for boxing, he even had a boxing ring in his backyard. He loved bullfighters and other rigorous sports. He served on the front lines in both World Wars and survived plane, boat and car accidents. As he aged, he became ridden with paranoia, suicidal thinking, alcoholism, and irrational acts. Toward the end this very fluent writer even struggled to put three sentences together. There is a book written by psychiatrist, Andrew Farah, titled “Hemmingway’s Brain”, which lays the case for the disease in this famous author. As times passes and research continues we make look back on many of our heroes and family members and ask if CTE could have plagued their life. The brain is much more fragile than we ever dreamed. CTE is a disease of the brain. To really understand the science of what’s going on, we’ll need some background on what the brain is like when it is healthy. A good place to start is by looking at our brain cells, or neurons. If you’ve ever heard someone talking about how brains are wired, or if you’ve heard someone talking about getting their brains firing, they were talking about their neurons. Neurons are the basic building blocks of the brain. Over 90 billion neurons connect in a complex network that allows us to interpret and react to our environment. Every neuron has three main parts: the cell body, the axon, and the axon terminal. We’ll focus mainly on the axon, which is a long and skinny structure that behaves a lot like a wire in an electrical circuit. Neurons communicate with one another by sending electrical signals down their axons and off to adjacent cells. It makes the axons fragile, and prone to injury during concussion. Things tend to break at their weakest point, and the axon is very often the weak point for the neuron. After a concussion, damage to axons is much more common than damage to other parts of the cell. A damaged axon has more trouble sending its signals, interfering with the brain’s ability to do its job. It makes it difficult for the cells to distribute chemicals and materials to all areas of the cell. Almost everything the cell needs to function is made in the cell body, but a lot of that stuff needs to be used along the axon or at the axon terminal. To get everything where it needs to go, the cell needs a transportation system. To help distribute chemicals and materials throughout the cell, neurons have a special transportation system, made up of tiny tubes called microtubules. These tubes run the length of the cell, helping materials from one end make it down to the other end. 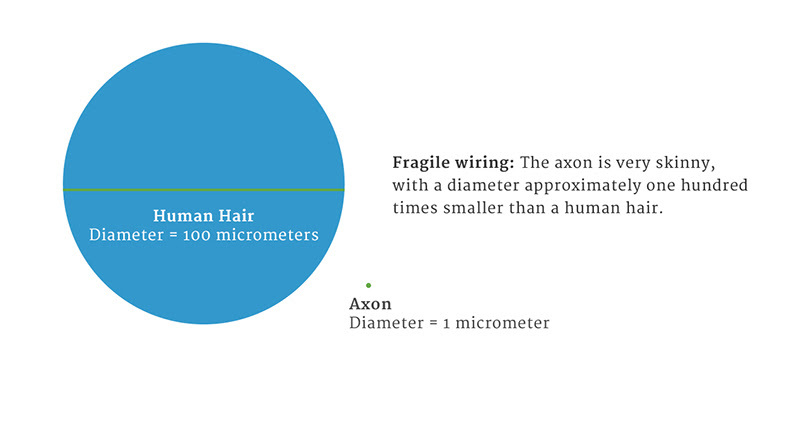 To continue with our example, if the axon were as big as a regular wire, each microtubule would only be as wide as a single strand of hair. Remember: axons are the weakest point of the neuron, making them the first thing to break during a concussion. Microtubules are much smaller and weaker than the axons, making them vulnerable not only to concussion, but also smaller impacts that may leave the axons intact. Since these tubes are so small, they need help supporting their structure. A special protein called Tau helps keep everything together by sticking to the tubes outside. In healthy brains, this is where the story ends: Tau supports the microtubules, microtubules help the cells function, and the brain operates normally. In diseased brains, however, the same protein that helped keep everything together can actually cause things to fall apart. 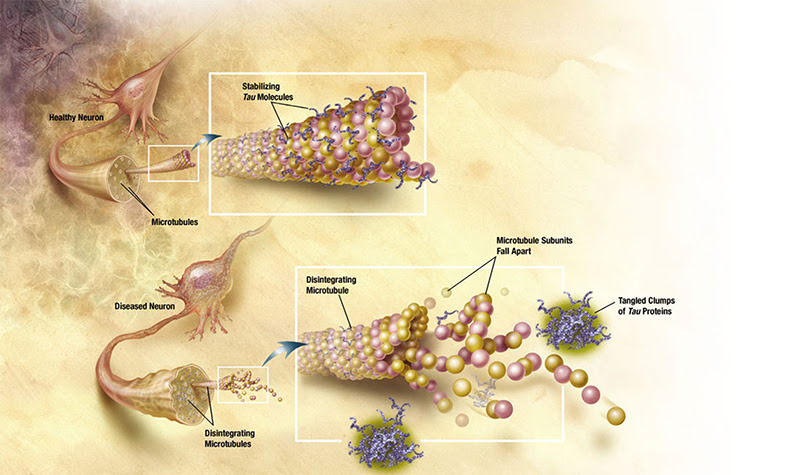 If the microtubules break down, Tau proteins can float freely inside the cell. Under certain conditions, the free Tau proteins can change their shape (in a process called phosphorylation), causing them to clump together. Once the clumps begin to form, they can spread to surrounding brain areas. At a certain point, the clumps take on a life of their own, and continue to grow and spread even without additional head impacts through a process known as prion spread. Scientists don’t yet know when this process begins, or if it happens to everyone who begins developing clumps or just in some people who are genetically pre-disposed. What scientists do know is that the Tau in CTE spreads in a distinctive pattern that is unique to CTE. Scientists also believe that the slow spread of Tau clusters is likely one reason it takes so long for symptoms to show up – it takes a long time for the slow moving clumps to infect enough brain tissue to change brain function.